Home Safe and Sound: the Journey continues…. 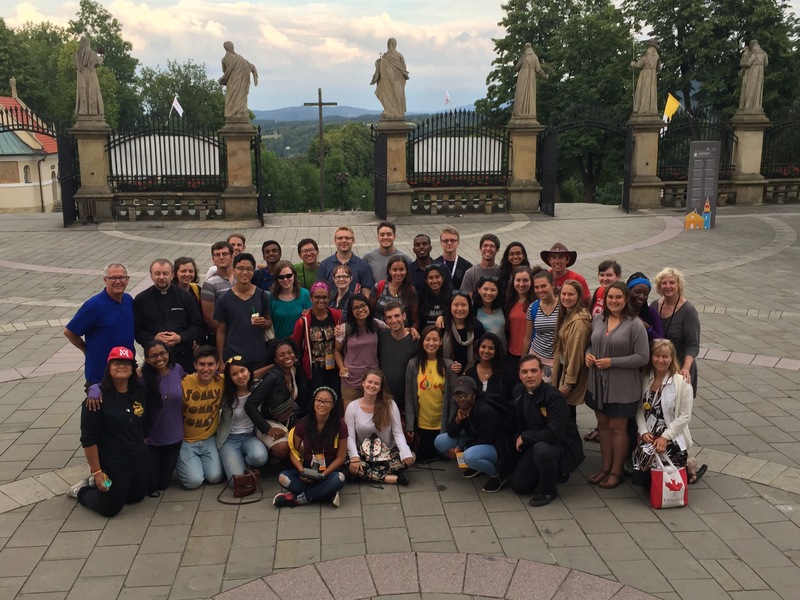 I have just spent an incredible 15 day pilgrimage journey with some of the finest young adults on this planet! Together we journeyed from Hamilton to Wroclaw, from Wroclaw to Kraków and from Kraków back to Hamilton. But far more significant is the spiritual journey that we all shared along the way. Together with our accompanying priests, Fr Kuzma, Fr. Adam, Fr. Peter, Fr. 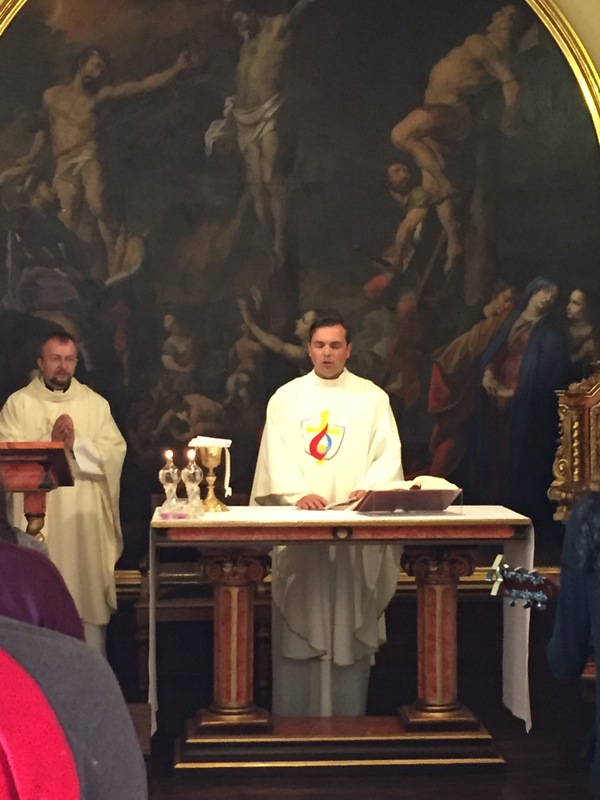 Michał and Fr Toby we journeyed as true pilgrims in prayer, adoration, song and community as we shared in the celebration of World Youth Day 2016. If you have been following these blogs you would have been keeping track of our physical journey. 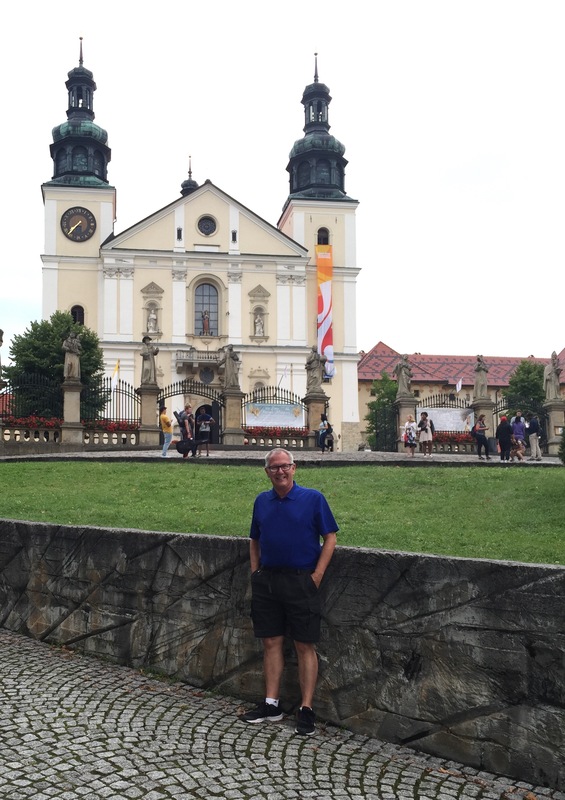 I have asked our pilgrims to share some thoughts on their spiritual journey and over the next little while I will continue to post these reflections. Seeing the commitment of these young adults, all between the ages of 18 and 35, to their faith was both energizing and empowering. We divided our pilgrimage into two distinct bus groups and this made getting to know the individuals much easier and on a more personal level than trying to keep 85 participants on track…and so each bus developed a commaraderie and personality of its own. Below you will see our diocesan bus group at the Shrine to Our Lady of Sorrows. I feel that despite the fact that I have a good 40 + years on many of these pilgrims I have made lasting connections and friendships with these young adults. They will be the catalyst for the growth of our Discipleship ministry in our Diocese. They are thirsty for more and already are talking about what we might do next. This is an opportunity not to be lost. “The first night of catechesis of WYD at Tauron Arena ended with a praise and worship concert with Matt Maher and Audrey Assad! Praise and worship music is a form of prayer that I fell in love with 3 years ago, and this concert took it up a notch. You cannot help but feel loved when, despite the fact there are thousands of people in the stadium, Jesus singles you out and you feel embraced, comforted, and compelled to pray even harder still. 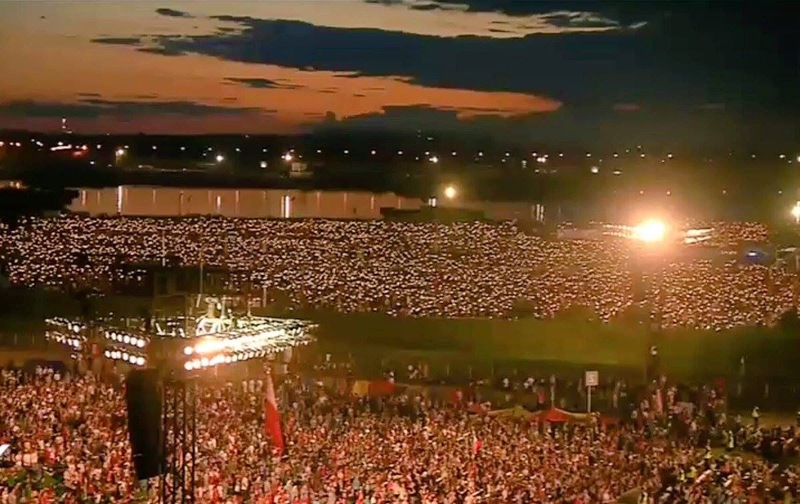 I got holy chills when thousands of Catholics were singing along to songs that I knew by heart while the Blessed Sacrament was processing through the crowd. Keep following us as we reveal more of our pilgrim stories and continue our ” Disciples on a Journey” blog. I’ve always been afraid of travelling but seeing you guys sacrificing for a greater good, for giving the sign of the true faith for Poland and the whole world-it gives me hope that I needed for a long time. It gives true strenght. So my next goal is to go to Canada, I will save money for this trip next year and who knows, maybe I’ll become brave enough to go to Panama in 2019. With God’s help, everything is possible, right?? 🙂 you are all truly beautiful and I will be following your next posts to be in touch with my favourite out-of-Poland diocese!